I have heard this too and have been trying it with my son...it seems to work! But I'm curious, do you rub it on the top of your feet or the bottom...or both? I had thought it was the soles of the feet, and so that's where I've been putting it. So far, so good...just wondering if I am correct? I was told recently that hot chocolate was good for coughs. But I guess it's not true? Never tried the vapor rub but I'll have to keep that in mind next time. I wonder if it's safe for kids? I'll have to ask the pharmacist. It sounds kind of like what eastern medicine does...they do some massage of the feet for headaches, sinus problems, etc. Apparently, there's all connected but don't quote me on it. What about honey? I heard that it's great for coughs. My mother used to scramble eggs with sesame oil and that always soothed my throat. Actually Joyful Learner -- I'll bet hot chocolate IS good for coughs. Just because the chocolate cure didn't help me, there's a lot of research backing it up. The combination of hot liquid + chocolate is probably quite soothing to a cough. 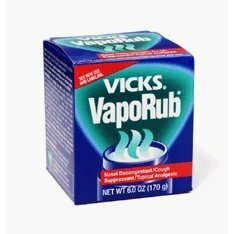 From what I understand the Vicks foot application is safe and works quite well for kids, though of course ask a pharmacist/doctor. I tried it on my 9yo and it worked well on her cough too. I've read accounts of some people who didn't find it helped at all, but I think with coughs you just have to keep trying things until you find one that works for YOU.